Special Order. Ships in 93 days. 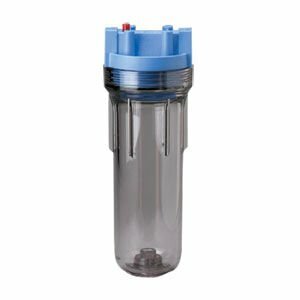 The Pentek 158117 1/4" NPT Slim Line 10" Clear Housing is made of clear Styrene-Acrylonitrile (SAN) that allows you to visually ensure your filter is operating at its optimal flow and capacity. The space-saving design of the Slim Line housing lets you install your housing in cramped spaces while still providing the same capacity of larger housings. The Pentek 158117 may be used in a variety of low-flow applications, such as undersink, countertop and pre- and post-reverse osmosis filtration systems. This housing may also be used in some humidifying systems, recreational vehicle filtration systems and food service applications. The Pentek 158117, also known as US Filter and Ametek part number 158117, installs using the four mounting bosses on top of the cap. You may also mount the housing to a wall using the Pentek 3G SL Mounting Kit. 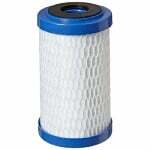 Click these links to view carbon and sediment filters for 10" standard filter housings.